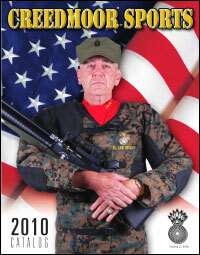 The 2013 CMP Sales Catalog is now posted online at http://www.thecmp.org/Sales/pdfs/catalog.pdf. Request your copy today at http://www.odcmp.com/CatalogRequest.asp. Products in the 2013 CMP catalog include: M1 Garand Rifles, Smallbore Rifles, Air Rifles, Replacement Barrels (newly manufactured), Garand Stock Sets, m1903 Stock Sets, M1 Carbine Stock Sets, Ammunition (commercial and surplus), Tools/Gauges, Rifle Cases, Shooting Coats, Shooting Gloves, Shooting Mats, and Instructional DVDs. Note: To order a rifle from the CMP, purchasers must provide proof of: 1) U.S. Citizenship (and age); 2) Membership in a CMP-Affiliated Organization; and 3) Participation in a Marksmanship or Other Firearms-Related Activity. 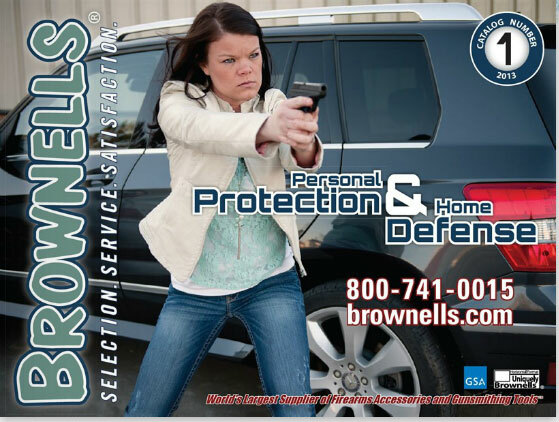 Share the post "CMP 2013 Catalog Now Online — Guns, Ammo, Stocks and More"
Brownells has released its first-ever Personal Protection & Home Defense Catalog. This full-color, 64-page Catalog (issue #1) features the most popular accessories, parts, holsters, magazines, cleaning supplies, and ammunition for home defense and personal protection. Additionally, the “Preparedness” section features an array of compact flashlights, knives, multi-tools, first-aid kits and emergency bags, plus less-lethal devices like the C2 Taser, collapsible batons, and pepper spray. To order the print version of the Personal Protection & Home Defense Catalog #1, visit Brownells’ Catalog Order Page, or call 800-741-0015. You can also access a fully-interactive, digital edition of the Catalog. CLICK HERE for Personal Protection/Home Defense Online Catalog. 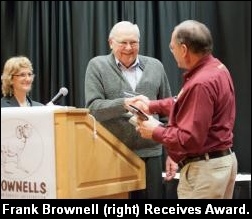 Frank Brownell, longtime President and now Chairman of the Board of Brownells, Inc., was recognized by the American Custom Gunmakers Guild (ACGG) on Thursday, March 28, 2013, during the Brownells 7th Annual Gunsmith Conference & Career Fair. Guild members surprised Brownell by presenting him with an Honorary Life Membership to the American Custom Gunmakers Guild. Brownell is the first and only non-craftsman to receive the prestigious award, according to the President of the ACGG, Michael Ullman. Share the post "New Brownells Personal Protection & Home Defense Catalog"
The latest Forster Products Catalog is now available. If you haven’t received a copy yet, you can download a digital PDF version, or submit a request for a print catalog. Just click one of the links below. Share the post "NEW Forster Products Catalog — Digital and Print Versions"
Sinclair International has just released its 2012 Christmas Catalog. The 24-page catalog is filled with hundreds of sale items. Among the holiday bargains found inside are special offers on Hornady and Redding presses, Lyman case cleaning equipment, bullets from Berger, Norma, and Sierra, in addition to brass from Lapua and Nosler – just to name a few. The sale prices shown in the catalog are valid through January 14, 2013. Customers who didn’t receive a print holiday catalog in the mail are encouraged to view the interactive digital version, which is an exact replica of the print edition. CLICK HERE for Sinclair Digital Xmas Catalog. In five days, starting at 12:01 am on November 22, 2012 (Thanksgiving Day), Sinclair International kicks off its Cyber Weekend Sales Promotion. Through the holiday weekend, you’ll enjoy special savings on a wide variety of merchandise — bullets, brass, reloading tools, shooting accessories, and more. Along with the deals on the Sinclair Int’l website, Brownells.com will be offering special savings as part of Brownells’ “Black Rifle Friday” sales event, which actually starts on Thursday, November 22nd. Share the post "Sinclair Christmas Catalog and Cyber-Weekend Promos"
CDNN Investments has just released its new Fall 2012 Catalog (issue 2012-4). 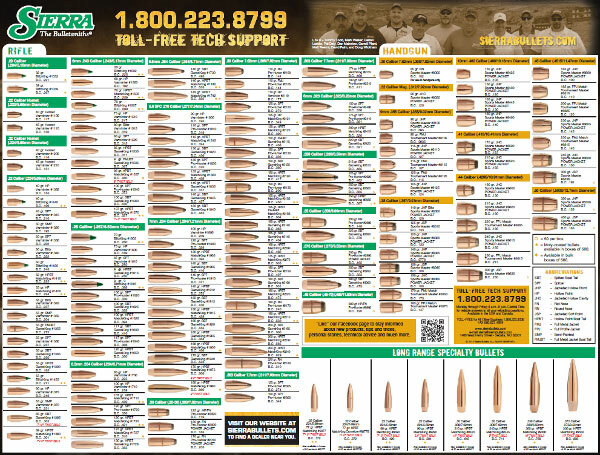 As usual, the Catalog contains impressive deals on handguns, rifles, shotguns, scopes, magazines, gun parts, and shooting accessories. CDNN acquires, at low prices, overstock and discontinued items from major manufacturers such as HK, Ruger, Sig-Sauer, and Smith & Wesson. CDNN then can sell this merchandise for well below typical retail prices. You can either view the CDNN Fall 2012 Catalog online or download a PDF version to your hard drive. We saw something pretty interesting in this Fall Catalog — Prescription BiFocal Shooting Glasses for just $6.99. 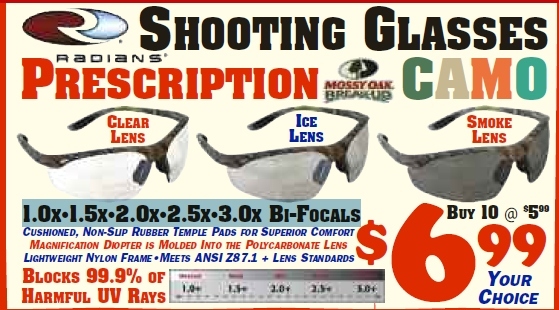 These Radians bifocals would be great for shooters who don’t want to spend $100.00 or more for prescription bifocal safety glasses. The magnification diopter is molded directly into the ANSI Z87.1-standard polycarbonate lens. Prescription ratings offered are 1.0X, 1.5X, 2.0X, 2.5X, 3.0X These shooting glasses can also be used when working with tools in the shop. The magnification would be handy when working with small parts. CDNN offers a wide selection of name-brand, non-magnifying protective eyewear as well. 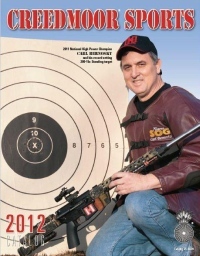 Share the post "CDNN Fall 2012 Catalog Offers Many Good Deals"
Creedmoor Sports recently released its new 2012 catalog — with 2011 NRA High Power Champion Carl Bernosky on the cover. Last year Carl won his NINTH National High Power Championship*. There is both a traditional print version of the new Creedmoor catalog, as well as a new digital version online. In the online digital catalog, you can flip the pages just like a real catalog, view page thumbnails, and easily print out catalog pages for future reference. In the new Creedmoor Catalog, we found some cool products you guys may not have seen before. Of course this is just a small sample of the thousands of items in the current catalog. Modern repro vintage-style scope ideal for Vintage Sniper Rifle Matches. If you shoot a 1903 Springfield or old Mauser in the sniper matches this is just what you need. 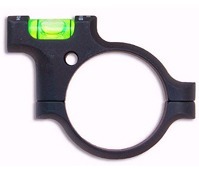 Fine cross-hair reticle with multi-coated lenses. The M73G2 features internal 1/2-MOA per click elevation and windage adjustment, with 60 clicks (30 MOA) per full turn. Total adjustment for both Elevation and Windage is 50 MOA each, i.e, 25 MOA up and down and 25 MOA left and right from the reticle’s centered position. This semi-opaque eye-shield clips on your shooting eyewear on either right or left side. This allows you to shoot with both eyes open, reducing eyestrain and fatigue. For cross-dominant shooters who don’t want to hold their rifle or pistol with their weak-side hand, this device can be very helpful. There are many leveling devices on the market, but we think this is one of the best designs yet (when mounted properly). The T-6 aluminum alloy level fits on your scope tube, with the bubble level set to the side for easy viewing when in firing position. The unit, offered in 1 inch, 30mm, and 34mm sizes, can be flipped so you can place the bubble on either the right side or left side. This unit is easier to see with your left eye than levels mounting in the center of the scope. Can you explain the 11 Hit Rule, the Excessive Hits Rule, the Insufficient Hits Rule, and what to do for a withdrawn target? If not, and you compete in High Power matches, you need this DVD. This useful resource can help match directors and score keepers, and it is an effective training tool for new pit workers. The DVD features over 300 color slides and shows scoring situations from both the Pit Puller’s POV and the Score Keeper’s POV. 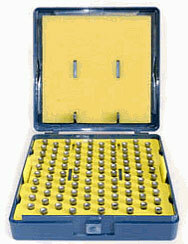 With this handy item airgun shooters can sort, count and arrange pellets. This is the best set-up for holding 100 match pellets in rows, and protected from damage. (It’s easy to ding the tails of pellets, which can really harm accuracy.) To quickly fill the box, just pour some pellets into the box, press down on the side tabs, and shake gently back and forth. If you sort pellets by weight (or other criteria), you can also place the pellets individually. *Bernosky has won the High Power Championship in 1977, 1978, 1979, 1980, 1992, 2000, 2007, 2008, and 2011. *In 1981 Carl won the Match Rifle division, but D.I. Boyd, a Service Rifle shooter, had the highest overall Aggregate. Share the post "Creedmoor Sports Releases New 2012 Catalog"
How’d you like to own the most comprehensive resource on guns ever created, an interactive database with information on over 50,000 firearms? 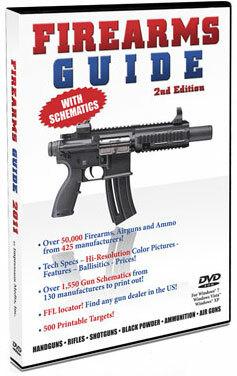 If that sounds intriguing, check out the $39.95 Firearms Guide on DVD (2d Edition) from Impressum Media. Think of this as a digital encyclopedia of guns — the mother of all gun reference guides. The sheer amount of information is mind-boggling. The Firearms Guide covers over 50,000 models of firearms, airguns, and ammo from 425 manufacturers. Products are illustrated with 27,000 high-res color photos, plus 1,550+ schematics with parts lists for 130 gun-makers. If you’re a gunsmith or armorer, you’ll want to buy this DVD, just to have the searchable schematics with part numbers handy. 500 Printable Targets: game animals, silhouettes, crosshairs, sight-ins, fun targets. FFL Locator – Searchable database of over 60,000 gun dealers in the USA with contact info. 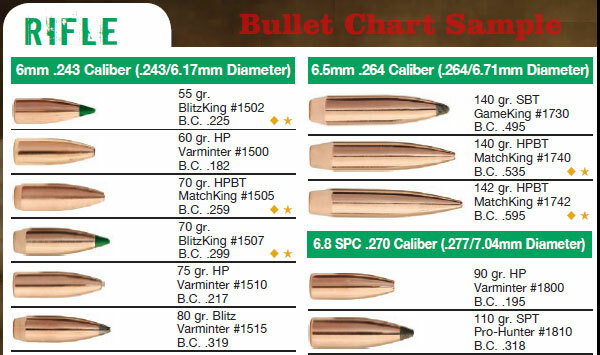 US-EU Ammo Caliber Chart: Cartridge equivalency charts identify the correct domestic equivalent of European ammo. Editors’ Comment: We were amazed with the sheer volume of data on this disk. It’s nice to be able to view the entire line of guns from major manufacturers (such as Ruger, Sako, Savage, and Sauer), along with products from “boutique” arms-makers. On the other hand, the vast majority of entries are mass production items. You won’t find many of the custom-built precision rifles that readers of this site prefer to own and shoot. Nonetheless, we enjoy being able to quickly see an entire product line, search a particular gun, and then access parts lists for repairs. I’ve got a .22LR Marlin Model 39A with a busted buckhorn rear sight, and I was able to find a replacement sight fixture in a matter of seconds. The FFL directory is handy and, as Gun Blast said in its review of this product: “The DVD is worth the price for the target images alone”. Disclosure: Impressum Media provided a review copy of the DVD at no charge. Share the post "Vast Encylopedia of Guns Offered on DVD"
The 2011 CMP Sales Catalog Issue II can now be downloaded (in PDF format) from the CMP website. Check out the new offerings before they sell out. You can also may request a 2011 CMP Sales Catalog hard copy by filling out the Request Form. The CMP is now on Twitter! Get CMP reports from Camp Perry by searching for ODCMP on Twitter.com or click the Twitter Icon posted below. During the National Matches CMP will also post updates on Facebook. Share the post "Download New CMP Catalog, Get Nat’l Match Updates on Twitter"
Brownells and Sinclair Int’l now offer a wide selection of rifle, handgun, and shotgun ammunition at competitive prices, backed by Brownells’ 100% satisfaction guarantee*. 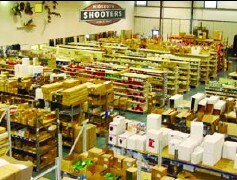 Brands include Winchester, Federal, Remington, CCI, Hornady, Fiocchi, Ultramax, Kent, Weatherby and more. “For years, customers have told us, ‘I sure wish you had ammo,’ well, we listened. We are offering the highest quality product at competitive prices, all backed by the high level of service Brownells customers have come to expect,” said company President Pete Brownell. Sinclair Int’l President and General Manager, Bill Gravatt told us, “When you don’t have the time to reload, you can count on Sinclair to offer you a wide selection of the highest-quality ammunition from the brands you know and trust.” The same Sinclair tech staffers who help customers with reloading questions are also available to help buyers select the right ammo. For their online customers, both Brownells and Sinclair Int’l offer the Ammo Advisor — an industry first. This interactive ammo database makes online shopping for ammunition quick and easy. 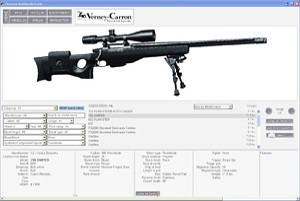 Use any or all of the fields and the Ammo Advisor filters the selection based on the shopper’s criteria. 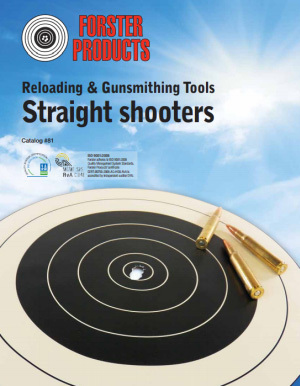 The selection fields are populated with all the top brands in the calibers shooters use most. “65% of Brownells customers shoot more than 25 times per year. We are taking the ammo shopping experience to the next level by offering customers a tool that is user-friendly. It makes shopping for ammo quick, fun, easy and convenient,” continued Brownell. 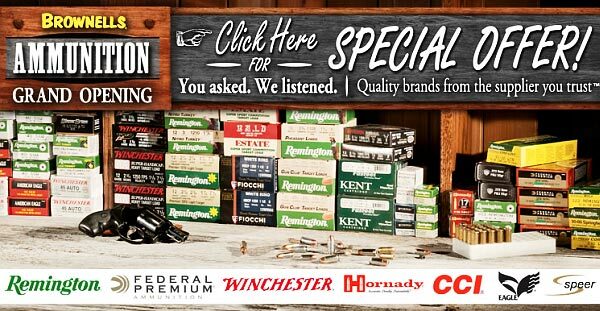 Of course, customers can always just head straight for their favorite brands without going through the Ammo Advisor. *Brownells exclusive 100% guarantee applies to all purchases so customers can rest easy knowing that they can return anything they’re not happy with — no questions, no hassles. Share the post "Brownells and Sinclair Int’l Now Sell Loaded Ammunition"
Forster Products has released a comprehensive product catalog in digital format. This FREE 36-page PDF (Adobe Acrobat) file includes all of Forster’s most popular products, such as the Ultra Micrometer BR Seater, Forster Case Trimmer, and Co-Ax® Press. 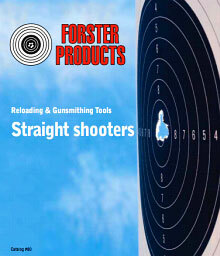 In addition, the catalog includes the many less-well-known but handy specialty tools crafted by Forster. 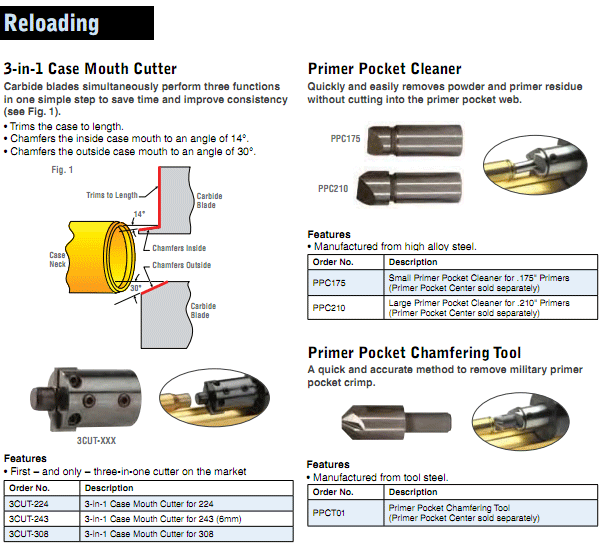 These include: 3-in-1 Case Mouth Cutter, Power Case Trimmer (for drill presses), Oversize Expander Balls, Co-Ax® Primer Seater, Inside Neck Reamers, Collet Bullet Puller, Stuck Case Remover, Swiv-O-Ling Vise, Magnetized Headspace Gauge Removal Tool, Gunsmith Screwdivers, and much more. CLICK HERE to Download Catalog. As shown above, all products are clearly illustrated with photos or diagrams, and inventory numbers are provided so you get exactly the right part when ordering. If you’re a serious reloader, you should download this catalog and browse through Forster’s full product line. We guarantee you’ll find something new and interesting — did you know, for example, that Forster makes a universal sight-mounting fixture for gunsmiths (photo below)? 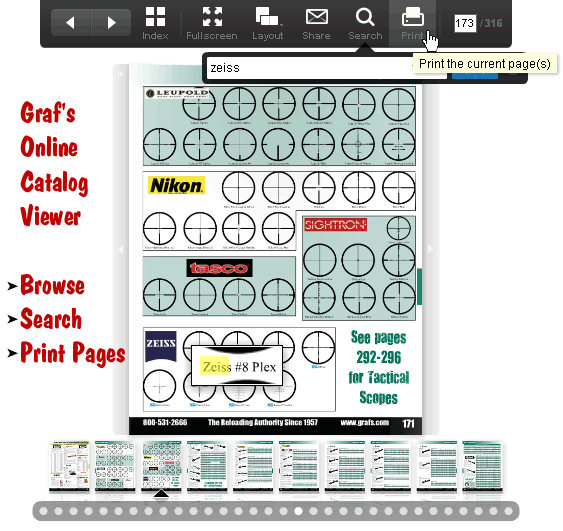 Share the post "Forster Products Offers Comprehensive Digital Catalog"
The new digital version of Graf & Sons 2010 Master Catalog is now available online. You can browse the entire catalog, page by page, and switch between single-page (presentation) and double-page (magazine) layouts. Keyword search is offered, and you can conveniently print any page for future reference. Shown below is the digital catalog viewer showing single-page layout with a search for “Zeiss”. By using the “print” command, one can print this page to save the reticle options for future reference. Search functionality, combined with the ability to print pages, makes the online catalog viewer very powerful. A hard-copy, print version of the catalog is also available on request. CLICK HERE to Request 2010 Printed Catalog. 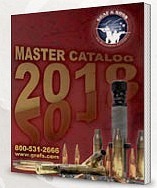 Share the post "Grafs.com Unveils New Searchable, Printable Digital Catalog"
The Creedmoor Sports 2010 catalog will be mailed out to Creedmoor’s customer list next week. Want a sneak peek? The complete, 88-page 2010 catalog, in digital format, is available online. CLICK THIS LINK to browse through the pages, search for products and zoom in for details. 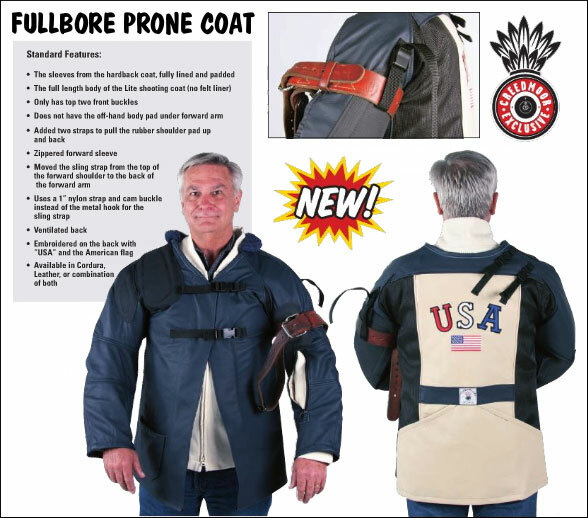 There are many new products in the 2010 Creedmoor Catalog, such as a new fullbore prone coat, with special features for belly shooters. Creedmoor worked with Dennis Flaherty, U.S. Palma Team Captain, to develop this product. $50.00 from the sale of each coat goes to support the U.S. Palma Team. Also new this year is a “No-Pulse” sling, item NPS-01, $81.95. The 2″-wide sling is made of synthetic material so it won’t stretch or shrink, no matter what the weather. Special “grippy” backing stabilizes the sling on your arm, while a unique dual-strap connection on the cuff dramatically reduces pulse effects. In addition, Creedmoor has a new, deluxe spotting scope mounting head (“Polecat” series) which comes in three versions, so it can fit 5/8″, 3/4″, or 1″ stands. 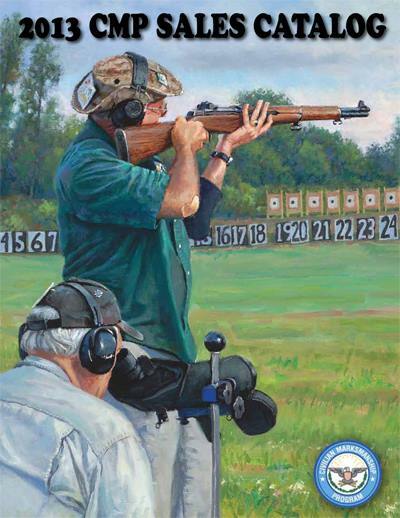 Share the post "Sneak Preview of NEW 2010 Creedmoor Sports Catalog"
Sinclair International has released its latest print catalog, the 2010-A edition. The new catalog has grown to 204 pages with more than 11,000 products. The new catalog features hundreds of new products from Sinclair, Redding, Hornady, Barnes, Redfield, Leupold, Nosler, Lyman, Lapua and more. Sinclair Int’l President Bill Gravatt revealed that: “Our tech staff are all certified, NRA Metallic Reloading Instructors who can help answer questions regarding reloading and shooting accuracy”. In addition to live assistance (via telephone), Sinclair offers many useful reloading tips via its Reloading Press Blog. To order Sinclair’s new catalog, you can call 800-717-8211 or submit a catalog request online. CLICK HERE to request a catalog. NOTE: You can also download a digital version of the latest catalog for FREE. 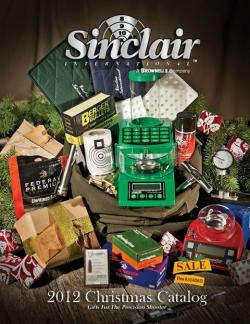 Share the post "Sinclair Releases New 2010-A Catalog"
Brownells has commenced a 37,000 square foot expansion of its Montezuma, Iowa, warehouse. Along with the new space, plans call for the addition of several new warehouse employees, plus more technology to assist order-picking, packing, and shipping. Share the post "Brownells Expands Warehouse to Stock More Inventory"
The latest Brownells Catalog #62, is now available and it’s bigger than ever. This monster 592-page catalog now contains over 30,000 total products, with more than 1,200 that are new since 2008. 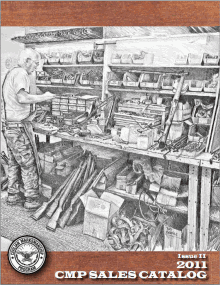 Some of the thirty sections include: AR-15/M16; 1911 AUTO; Rifle and Shotgun Sights; Holsters and Mag Holders; General Gunsmith Tools; Metal Finishing; Screws and Hardware Kits; plus sections for Rings and Bases; Books and Videos; Optics and Accessories; and Stockwork. According to company President Pete Brownell, “The ‘Dream Gun’ idea has proven to be very popular and we’ve updated it with six new-to-the-big-book ARs and another eight new 1911s showing some ideas on building a gun just the way you want it using products in the Catalog”. Catalog #62 is currently available for purchase. To order, or for more information, call 800-741-0015 or visit Brownells.com and mention code “PFE”. 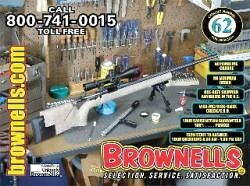 Share the post "Brownells Releases Catalog Number 62"
Brownell’s new, enhanced website is now “live”. The new site is easier to navigate, and “how-to” features such as the Gun-Tech articles/videos are more accessible. Featured Products and New Products are now located “front and center”. The search function is much more user-friendly. 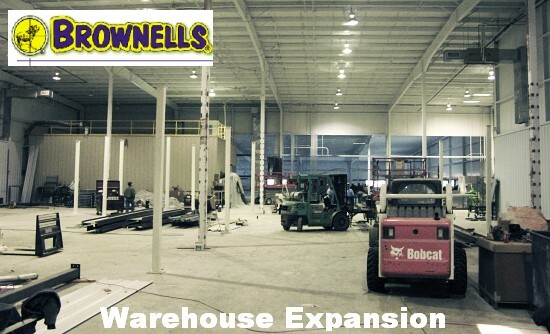 Brownell’s has even created an animated TUTORIAL explaining all the new features. CLICK HERE to watch the tutorial. To make it easier to find products by type, all products are grouped into nine tab-linked classes on the home page: Rifle parts, Handgun parts, Shotgun parts, Magazines, Shooting accessories, Gunsmith tools, Optics, Gun cleaning, and Books & videos. With one click you can now access all the optics, or all the videos for sale. Product images can be enlarged with a simple click and many include 360° viewing options. We really like the fact that customers can now rate, review and comment on products. You can also get your questions answered through the interactive Answerbox feature. The GunTech and Shopping areas are now more heavily linked to make the videos, articles, cheat sheets, instructions found under GunTech easily accessible from the product pages. Products are also now accessible from the GunTech pages. 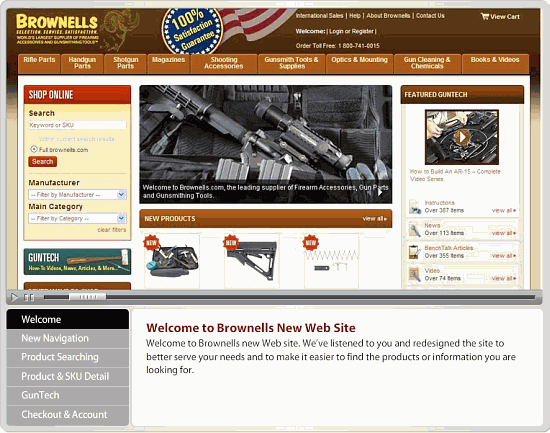 Share the post "Brownell's Launches Updated Website"
Midsouth Shooters Supply boast one of the largest inventories of shooting, reloading, and hunting products you can find. Midsouth is also known for fast service — 99% of all in-stock orders are shipped usually within 24 business hours of receipt. Midsouth just released its latest 240-page Master Catalog, in both print and digital format. If you ordered from Midsouth in the last 24 months you should be receiving your “hard-copy” 2009 Master Catalog in the mail very soon. If you don’t want to wait, you can download the Catalog now. The entire 240-page Midsouth Catalog, with thousands of products, can be downloaded for free. It is a large (20 megabyte) file, so if you have a slow connection, you can also download smaller, 40-page Catalog sections. CLICK HERE to go to Catalog Download page to select sections. Share the post "Midsouth Catalog Available for Download"
Sinclair Int’l has released its latest catalog of products for precision shooters. As always, the Sinclair Catalog is packed with interesting gear, and this 2009-A catalog has a bunch of new products. Most notably, the catalog features a wide selection of Nightforce scopes, including the Benchrest models. Sinclair Int’l is now a stocking Nightforce dealer. The 12-42×56 BR model is Sinclair Product 72-1045, priced at $1359.00. 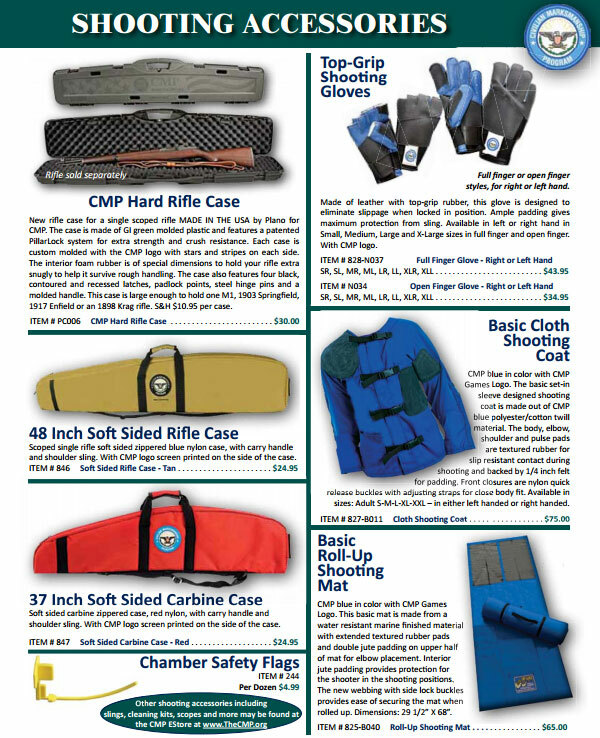 Among the many new items in Sinclair’s catalog are two new products from Edgewood, makers of sandbags and high-quality leather shooting products. The first Edgewood addition will make old-fashioned bag-squeezers rejoice. 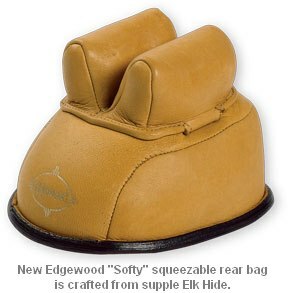 Edgewood’s new “Softy” is an extra-soft squeezable rear bag is made of heavy Elk Hide. The Softy’s base is extra thick, but still soft (not a hard donut like Edgewood’s otherbags). This bag is approximately 3-1/2” tall with medium height ears and a 3/16” ear spread. Sinclair comments: “If you prefer to squeeze the rear bag for minor sight adjustments instead of turning knobs on your front rest, this is the perfect rear bag for the job. The Softy’s taller, soft ears will accommodate just about any stock style.” The Softy, Item 04-7575, retails for $135.50. 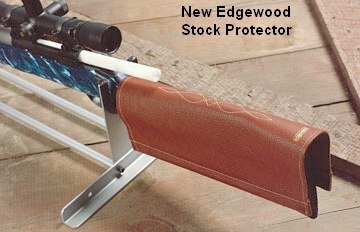 The second Edgewood item we noticed was the new leather Stock Protector, item 04-7580. Yes, we know, a cheap, old towel can do the same job, but the $32.95 Edgewood product will stay in place better than a towel and it provides a better barrier against solvents that might harm your stock’s finish. This is a beautifully-made item, a shooting accessory for the “man who has everything”. Two 1/4” steel rods are sewn into the side edges of the stock protector to keep it in place on the stock. Made of a single piece of quality leather, the Edgewood Stock Protector is 9-1/2” wide and 12” long. Sinclair’s 2009-A catalog is free for the asking. CLICK HERE for a catalog request form. Fill it out and Sinclair will mail its latest catalog to you. 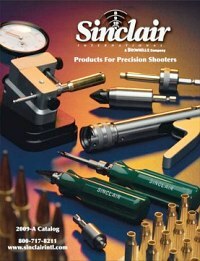 Share the post "Sinclair Int'l Releases New 2009 Catalog"
The latest editions of Remington’s product catalogs are now available online. 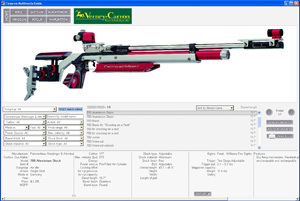 You can download the entire 2009 catalog (a 19.5 mb file), or select particular product lines: rifle, shotgun, ammunition, accessories. 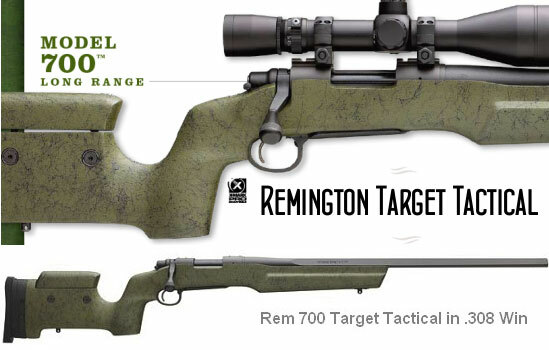 The Rifle Catalog features all the latest Remington rifles, including the new Model 700 ‘Target Tactical’ model. This 11.75-lb gun boasts a Bell & Carlson composite stock with ergonomic grip and adjustable LOP and cheekpiece. 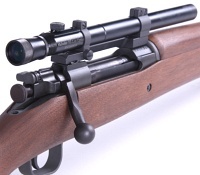 The Target Tactical is offered in .308 Winchester only, with a 26″ hammer-forged 5R barrel with triangular profile. MSRP is $1972. 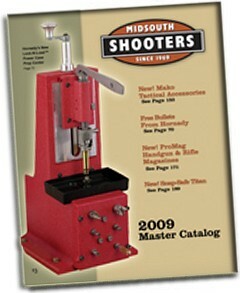 Share the post "FREE Remington 2009 Catalogs and Ballistics Sheet"